Micromax latest smartphone, Micromax Canvas XL2 listed on the official website. It is the successor of Micromax Canvas XL which was launched earlier this year. The new Micromax Canvas XL2 has 5.5-inch qHD (540*960 pixels) resolution IPS display and powered by 1.2 GHz quad-core MediaTek MT6589M processor along with 1GB of RAM and runs on the latest Android 4.4 KitKat. On the photography side, It has 5 MP auto-focus rear camera with LED flash and 0.3 MP front-facing camera. It has 4 GB of Internal Storage in which 795 MB is available for app storage and 1.43 GB is available for mass storage. It is backed up with 2500 mAh of battery in which company claims talk time of 8.5 hours. 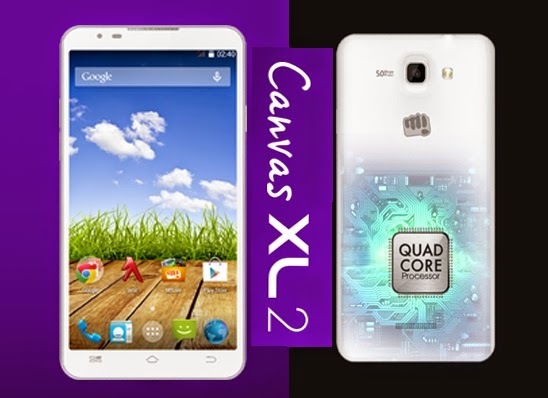 Micromax Canvas XL2 comes in white color and listed on the official website. There is no official wording about price and availability of the smartphone. Stay tuned with us to get more information. UPDATE:- It is now available exclusively on infibeam at a price tag of Rs.10999. It seems that price is high according to the specification of the smartphone. The price must be below 10k.